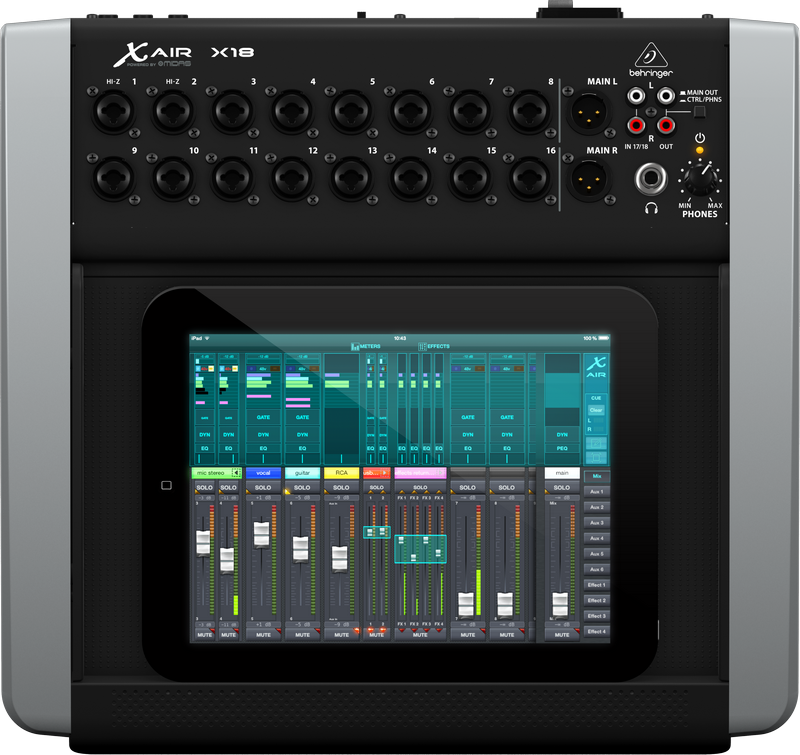 Designed for the ultimate in mobility, the X18 comes with an integrated Wifi module for direct control of your mixer’s functions – without the need to setup and configure an external router. The X18 gives you the freedom to focus on your mix, while allowing you to move about the venue to experience what every part of the audience is hearing. Plus you can adjust live monitor wedges from the artist’s perspective – or better yet, let them mix their own IEMs and floor monitors via their own tablets. 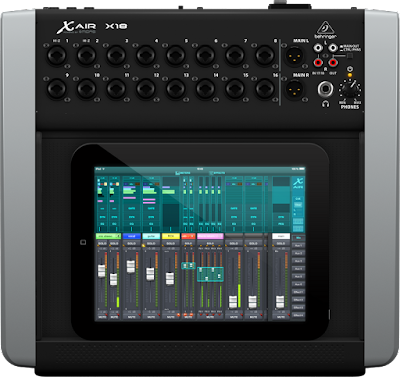 The incredibly fast and comprehensive 18 x 18 channel, bi-directional USB interface makes the X18 an amazingly powerful digital mixing solution for recording directly to your iPad or PC. Dial in the perfect monitoring mix with effects and zero-latency, while sending up to 16 microphone signals – and the keyboard player’s MIDI notes to your DAW for recording. A major first for compact audio mixers, our revolutionary X AIR Gain Sharing technology can easily manage fully automated mixes with up to 16 live microphones. Based on the legendary Dan Dugan automix system, the X18’s gain sharing paradigm automatically controls the levels of all selected microphones in real time, without any gating artifacts or noise modulation. 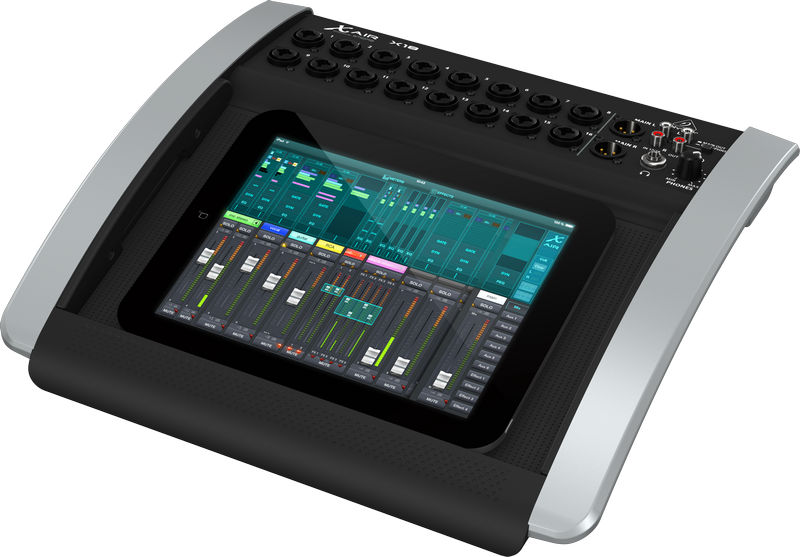 Equipped with the very same FX engines as the now legendary X32 Digital Mixing Console, the Onboard virtual FX Rack provides access to four true-stereo (8 mono), multi-effects processors including delay, chorus, dynamics – plus the X18 can run production-quality, true-stereo reverbs concurrently with 31-band EQ on the main and aux buses, all without the need for any additional hardware. You can select any combination of high-end simulations of legendary studio effects, such as the Lexicon 480L and PCM70, as well as the EMT250 and Quantec QRS reverbs. Onboard processing means your computer doesn’t have to do the heavy lifting during a mixing session with DAW plugins as the X18 has a whole studio of FX under its hood. Custom-designed, and physically modeled after some of the most iconic and sough tafter processors, all effects run inside the low-latency environment of the X18 mix engine, ensuring flawless performance, flexible routing and the end of cable faults forever! The X18 includes a high-resolution 100-band Real Time Analyzer (RTA), with full Bar and Spectrograph views. This high-resolution RTA displays the audio energy distribution in 100 frequency bands over time – capturing a sonogram window of a full 10 seconds. Switch between the Large RTA view, displaying any available signal in full screen resolution, or the Combined RTA view shown above each of the channel and bus EQ curves – and see the results of your filtering choices. Additionally, the RTA can be displayed on top of the 31-band graphic EQs in the Main LR or Aux buses. Monitoring and controlling frequencies has never been easier! The easy way to send sound, our ULTRANET connectivity allows you to send 16 digital sources over a lightweight and easy-to-deploy Cat 5 cable to P16-D Digital ULTRANET Distributors, or directly to P16-M Personal Monitor Mixers. This powerful and advanced technology makes it easy for individual performers to create their own “more me” mix – and frees you up to put on your best show. ULTRANET also provides the perfect conduit for sending your mix to the new TURBOSOUND iQ Series loudspeakers, which can tap into the 16-channel digital bus directly. While the tablet mixers made by our competitors only work with iOS-compatible tablets, the X18 is an equal-opportunity launch pad for your dreams thanks to its ultra-wide tray that accepts PC/Mac*/Linux* mini-notebooks and tablets, Android* devices – and yes, even iPads of all sizes. By using an internal Wifi router and a suite of ultra user-friendly dedicated apps, the X18 is the one tablet mixer on the market that accommodates the world’s most popular operating systems! The X18 allows you to achieve the same incredible level of EQ finesse as the award-winning X32 thanks to its 100-band Real Time Analyzer, which is built into every input channel and bus EQ. Visual feedback built into the control app allows you to see and make fast, surgical adjustments to frequencies in need of a boost or a cut. You’ll wonder how you ever EQ’d without it! In addition to the Main L/R bus for Front of House, 6 Aux buses are provided for dialing in the perfect monitor mixes, complete with inserts, dynamics, and either a 6-band parametric EQ or 31-band graphic EQ. And if all these outstanding EQ options put a smile on your face, you’ll love it even more when we tell you that 100-band RTAs are available for these, too! The physical MIDI I/O port on the X18 mixer can also be used for connecting external MIDI controllers, such as our X-TOUCH or B-CONTROL products, for dynamically controlling channel level, muting and panorama adjustments during your performance. And since the full-featured X18 also supports the Mackie Control protocol, you easily apply comprehensive remote editing and parameter adjustments via any compatible MIDI devices.